Photo: The exterior facade of the Dubuque Malting Company, also known as Dubuque Brewing Company and Dubuque Brewing & Malting Company. The iconic midwestern cities Milwaukee and St. Louis are synonymous with domestic beer production. Schlitz, Pabst, Miller, Anheuser-Busch, and other big-time operations have been around since the 19th century. Facing growing competition the Heeb, Iowa, Western, and Northern Breweries joined forces to form the Dubuque Malting Company in 1892. The taps have long ran dry, but the monumental building they built still stands to this day. In 1895 the company began construction on 30th and Jackson Street. The modern brewery cost $500,000 (or $13.8 million adjusted for inflation) to build and equip. The first floor of the Jackson street frontage is cream-colored Bedford stone, while the rest of the buildings are pressed brick. The 10-acre property includes office, stock, brew, mill, boiler, machinery bottling, barn, wagon, garage, and other minor buildings. Electrical wiring provided power for over 200 lamps throughout the entire complex. An artisan well with a six-inch diameter output flow provided ample water supplies for brewing. On May 7, 1896 the brewery greeted 20,000 guests at its grand opening. When the fanfare subsided the brewery began round the clock operations. The approximately 225,000 square foot facility was able to produce 300,000 barrels annually according to advertising, but more realistic figures place that number around 190,000. Within the Dubuque city limits beer was delivered by electric vehicles traveling at 6mph. Beer destined for other locations horse-drawn wagons, gas-powered trucks, and refrigerated railroad cars. Like many contemporary large brewery operations the company expanded into real-estate by owning corporate saloons. When ordinances passed forbidding breweries from directly owning real-estate, the Dubuque Realty Company was formed as a shell company. Distribution ordinances limiting sales to approved businesses were evaded by founding the East Dubuque Supply Company. However, no shrewd corporate lawyer or crafty bookkeeping tricks could avoid the rising influence of the Prohibition Movement. In 1915 the state legislature repealed the Mulct Act, which effectively outlawed saloons from operating in Iowa. Another deadly blow to the local brewing industry was dealt in 1918 when an amendment to the state constitution barring alcoholic beverages went into effect. The Dubuque Brewing & Malting Company could not weather the shift in political climate, and ceased operations. During the coming decades the building would be used or considered for various purposes. A meat packer, a failed upstart brewery, a trucking company, a packing business, and a potential corn refinery never matched the economic glory of the former brewery. In 1978 the building was nominated to be added to the National Register of Historic Places, but later removed at the behest of the owners. 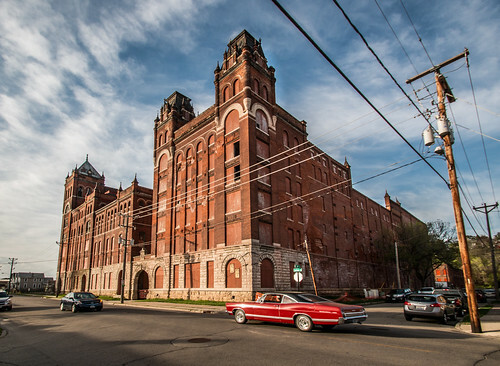 Photo: The formidable towers of the Dubuque Brewing & Malting Company. Efforts to demolish the structure were thwarted in 2005 when the city placed the property within a conservation district. In 2010 the city ordered repairs to bring the building up to code, but few have been performed due to lack of funding. 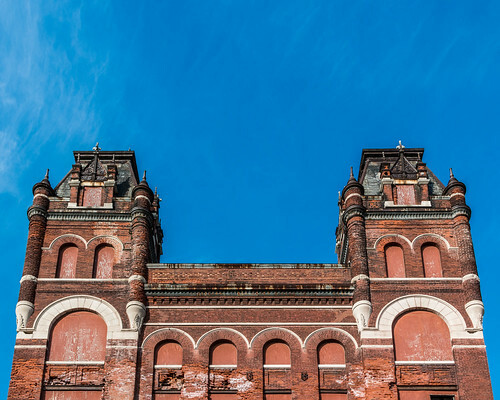 Preservationists continue to hold on to hope that the romanesque structure will find a new purpose. Today the Dubuque Brewing & Malting Company building is surrounded by a shipping company, auto repair shops, and a trendy gentrified restaurant. Middle-class homes are dwarfed in comparison to the castle towers at the edges of the complex. Wood covers a majority of the windows blocking sunlight from penetrating the ash covered interior from a 2009 fire. Crimson bricks crumble from all corners of the external façade, exposing just how thick its walls truly are. The current owner runs an eponymous business called Jim Krueger Auto & Truck Parts on the ground level. Empty husks of rusting classic cars, piles of rubber tires, and other miscellaneous parts are strewn about in the darkness. Much like the preservationist’s hopes for the brewery, Jim holds on to the notion that one day the decaying cars will be returned to their former glory. The minute it is gone someone will surely come looking. 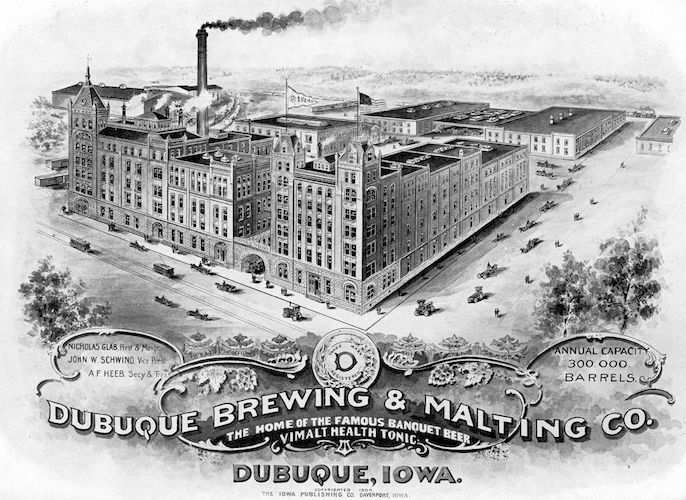 Encyclopedia Dubuque – Comprehensive history of the Dubuque Brewing and Malting Company. Google Books – Encyclopedia of Temperance, Prohibition, and Public Morals mentions Iowa prohibition. Google News – May 8, 1896 Dubuque Sunday Herald article covering the opening ceremonies. Google News – April 2, 1933 Telegraph Herald and Times Journal article on Dubuque brewing history. NRHP – #77001564 on the National Register of Historic Places. Sioux City Journal – May 11, 2013 Article on current owner Jim Krueger. Jim Krueger has never owned any of the property at the old brewery. He is a tenant.